Leaving the reef in the morning we wanted to reach Hamilton Island early afternoon to hide in the marina ahead of the bad weather approaching. But so far the day had been fantastic and by noon we were back around Hook Island. We decided then to stop at lovely Langford Island for lunch. 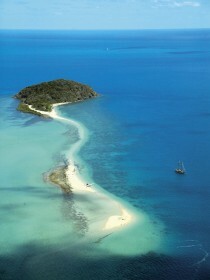 This small island, near Hayman in the northern Whitsundays is a popular spot, with a long sand spit that all but disappears at high tide. It is surrounded by coral reef on all sides and there are lots of public moorings, so there is no problem to stop there. We went for a walk on the sand spit as the tide was coming up and saw little sharks swimming in the shallow waters. We arrived at the marina on time to get help from the friendly staff to dock Zenitude. We were wondering where the bad weather was and could have probably stayed another day at the islands. Since we were back in a civilized and touristy place we headed for dinner in search of a good restaurant. It was a disappointment. We didn’t found the atmosphere we were looking for and the attractive restaurants all required previous booking. We ended up having an expensive and not so good dinner in one of the resorts. We did find the yacht club very charming with an interesting architecture. It is next to the marina and has a nice open air bar. The next day to our arrival the bad weather arrived. The marina is home to a fleet of charter boats and we felt sorry for the people that were charting that week. Some of them not even leaving the marina for a couple of days. From Hamilton we sailed to Airlie Beach in the coast and arrived at Abbel Point Marina to get ready to pick up our friends Edu and Emi that were arriving in Townsville in a couple of days. After much consideration, we had decided to drive to Townsville and bring them back by car so that we could sail up to Townsville with them. We had booked Abbel Point marina for that week quite ahead of time but there was a mix-up with the booking. Firstly they assigned a berth that was so shallow at low tide that we couldn’t get in or out of there. Resolute run aground trying to get out when we arrived as this was our assigned berth. We had to wait several hours at anchor outside the marina for the tide to raise. Holding there is poor as it is a soft mud and you need to stay for a couple of days in settled weather before the anchor buries down and holds you when the wind picks up. When we finally got in the berth we found out they wanted us to leave exactly the day we were planning to be in Townsville. They finally gave us a berth in the old part of the marina which is not as nice but at least we were able to stay there. The marina was full for race week and while the staff tried hard to accommodate everybody it didn't help they don't seem very organized. Eventhough the atmosphere was great we decided next time we’ll pay attention and avoid race week at all costs. On Monday we rented a car and drove to Townsville were we slept overnight. 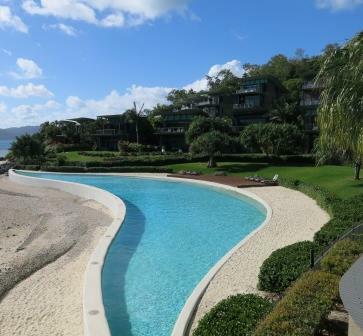 Our friends arrived next morning and we drove back to Airlie Beach. Emi and Edu are from Argentina and they've been our friends for what it seems our whole life. 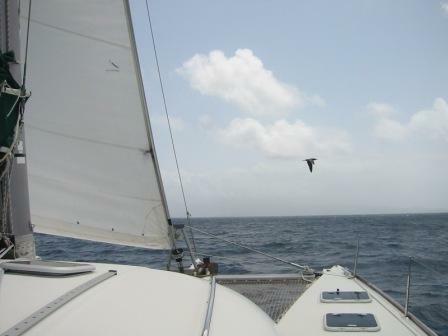 This was the first time for them in Australia and where quite enthusiastic about the whole sail adventure. The first three days after their arrival the weather was so awful we couldn't even leave the marina and we tried to amuse them around Airlie Beach.